I’ve done a lot with eggs, but I’ve never topped a salad with one! The inspiration came from a newer restaurant here in San Diego, 100 Wines, from the Cohn Family Restaurant Group (one of our favorites), view the amazing menu here: 100 Wines Menu. They’re very accommodating with gluten-free, grain-free, etc. and willingly substitute breads/pita for crisp vegetables, or will remove ingredients you can’t eat, etc. I met a girlfriend for dinner there and I enjoyed the Mixed Greens salad: poached egg, crispy pork belly, ciabatta crouton, piquillo, peppers, ginger apple dressing-sans the ciabatta crouton of course 🙂 It was fabulous! I can’t believe how awesome the yolk was mixed in with the salad. I told Seth about it, and he made this one night recently! You can use any burger patties you choose, seasoned however you want, and same goes for the salad and it’s ingredients-be creative. 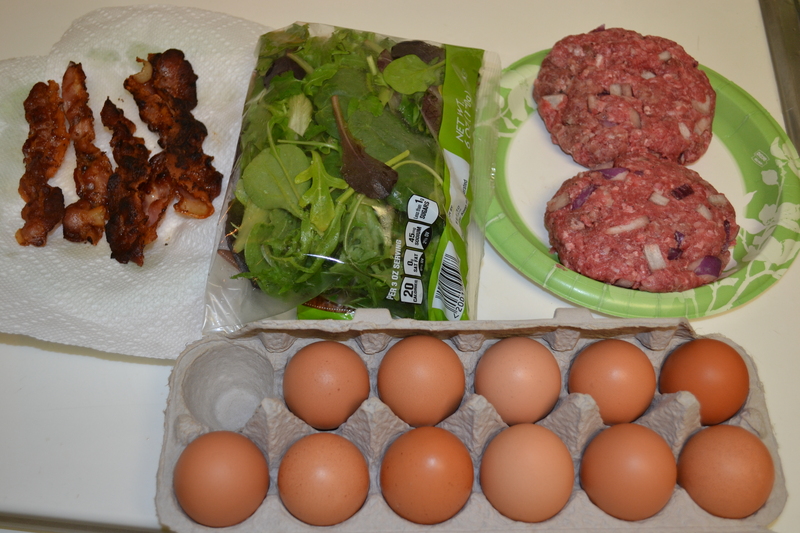 Make the salad, top with burger, bacon and poached eggs. 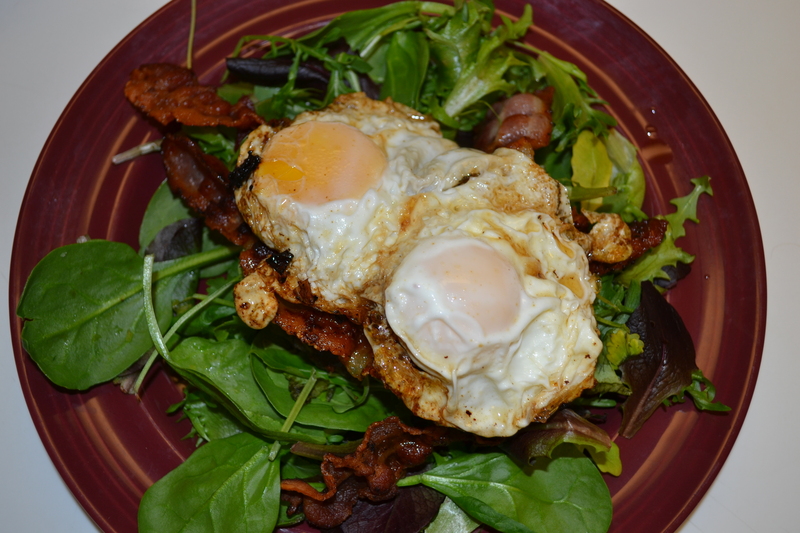 Mix altogether-the key is a little runny yolk, it flavors the salad so well! This entry was posted in Recipes and tagged 100 Wines, Bacon, Burgers, Cohn Restaurant Group, Gluten Free, Grain Free, health, Healthy Fat, Hillcrest, Nourishment, Paleo, Poached Eggs, Salad, San Diego, Versatile by livinglikelinds. Bookmark the permalink.